It's never a good idea to be overly-relient on technology while traveling Look up words quickly and easily with this great little Indonesian dictionary. 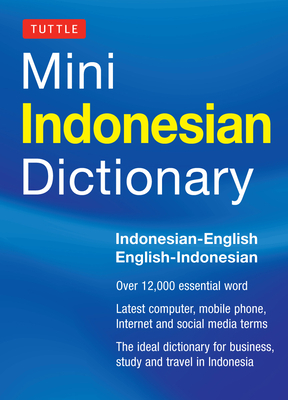 Tuttle Mini Indonesian Dictionary is ideal for any application where a handy and portable dictionary is required. Intended for use by tourists, students, and business people traveling to Indonesia or as an Indonesian language study reference Mini Indonesian Dictionary is an essential tool for communicating in Indonesian and a great way to learn Indonesian. It's useful pocket-sized format and easy-to read type will make translating Indonesian much easier. In addition to being an excellent English to Indonesian dictionary and Indonesian to English dictionary Mini Indonesian Dictionary contains important notes on the Indonesian language, Indonesian grammar and Indonesian pronunciation. All Indonesian words are written in English as well as Indonesian script so that in the case of difficulties the book can simply be shown to the person the user is trying to communicate with. Over 12,000 essential Indonesian words, as well as useful Indonesian expressions and idioms. Headwords printed in blue for quick and easy reference. A basic overview of Indonesian grammar and pronunciation. All the latest Indonesian social media and computer terms. May be used for all U.S. ESL standardized testing. Katherine Davidsen completed her BA (Hons) in Indonesian at Monash University. She has since worked in Melbourne, Indonesia and Hanoi, teaching English ESL, Indonesian and Japanese. She is the author/editor of the revised Tuttle Concise Indonesian Dictionary and is currently working on her Masters in Applied Linguistics at the University of Southern Queensland.